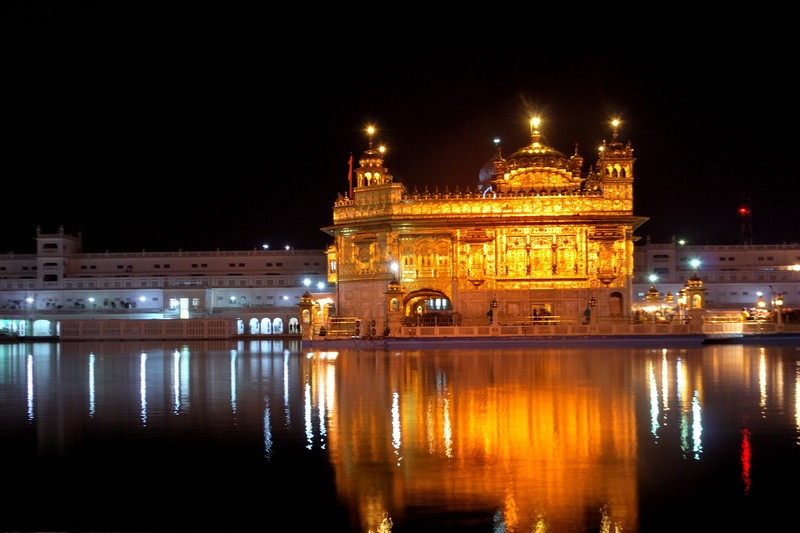 Amritsar – The land of spiritual awakening has always fascinated me. The aura which mesmerizes and engulfs you at the Harminder Sahib aka The Golden Temple is something that I believe no one can explain in words. It is a journey to the other world with just one belief that we are all there for one reason. 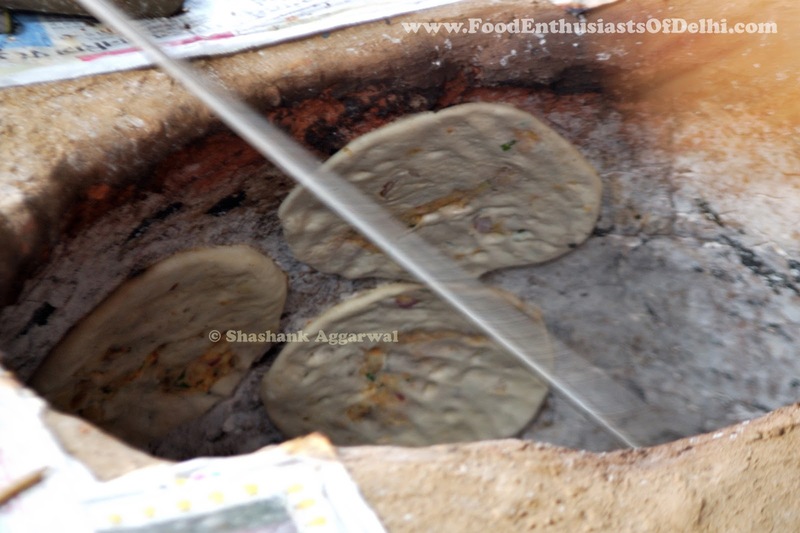 Travel to Amritsar has always been a sought of spiritual journey and since I have been to Amritsar quite a few numbers of times and visited a number of places to eat I always knew that Amritsar had a lot more to offer, that I had tasted just the tip of the Food Iceberg and right I was, after I came across fellow foodie experiences and suggestions. After I saw the HUGE list of places we had to cover, the question was how will we survive? But, hey when are we going there, after some discussion rather a dictatorial decision 17th February, 2012 was set as the departure date. The team was confirmed to be of 7 members. After some last minute additions and drop-outs and flipping, skidding, jumping between a Xylo, Innova and Tempo Traveler we finally got the Tempo Traveler (Many Thanks to Honey Kansal). Patel Nagar Metro station was the departure point for the food brigade (I think that’s what I will call us for this Food Raid à Amritsar) and quite interestingly all of us were on time, sharp at 10 PM. The Udan Khatola (Tempo Traveler) was ready to fly after all of us had nicely settled in and stacked up the supplies. As soon as we hit the highway, the stomach monsters started growling and everyone was super hungry. 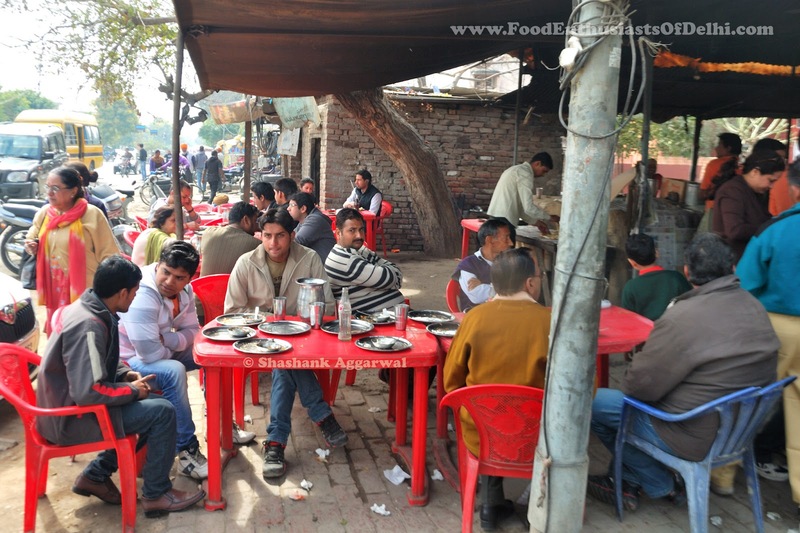 We decided to check out one of the Murthal Dhabas and our first stop was Ahuja No.1, we ordered Gobhi, Aloo-Pyaaz and Paneer Paranthas, Dal Makhni and some hot piping tea. The Dal came with white butter and the paranthas were supplied with a full katori (small bowl) of white butter. The Paneer Parantha was a big disappointment but the other two made the day for us, rather night. The stuffing in the aloo-pyaaz and Gobhi parantha was more than sufficient, just like a stuffed parantha should be and with dollops of white butter flowing like a small stream between the paranthas it was nothing short of a treat. With an unscheduled stop hitting us as a whirlwind we decided to make a stop at Ludhiana for breakfast. It was 8:30 AM and we were feeling hungry of sorts. 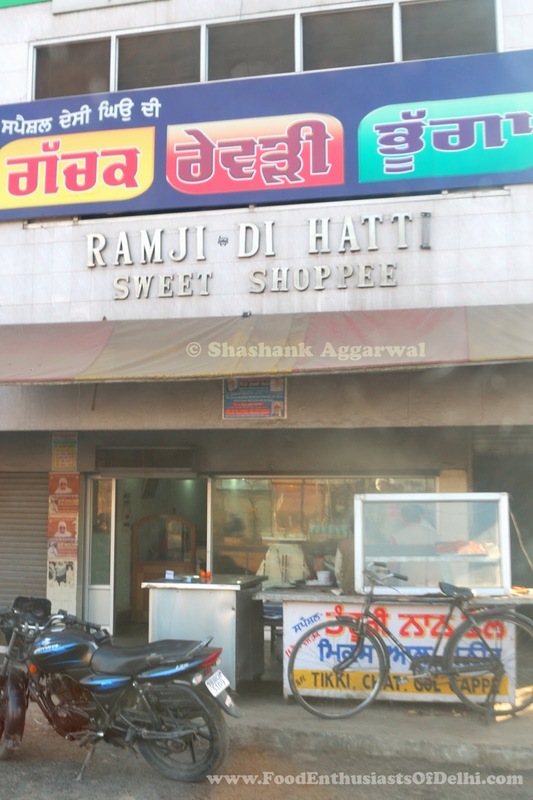 After getting directions for a good eating place, we landed at Ram Ji Di Hati near Gill Chowk, Ludhiana. After, the crackling bones in our bodies had settled down, our eyes lit up at the sight of fresh poori being tossed out. As the food brigade marched in and literally took over the seating area, the order was placed and the waiting game began. 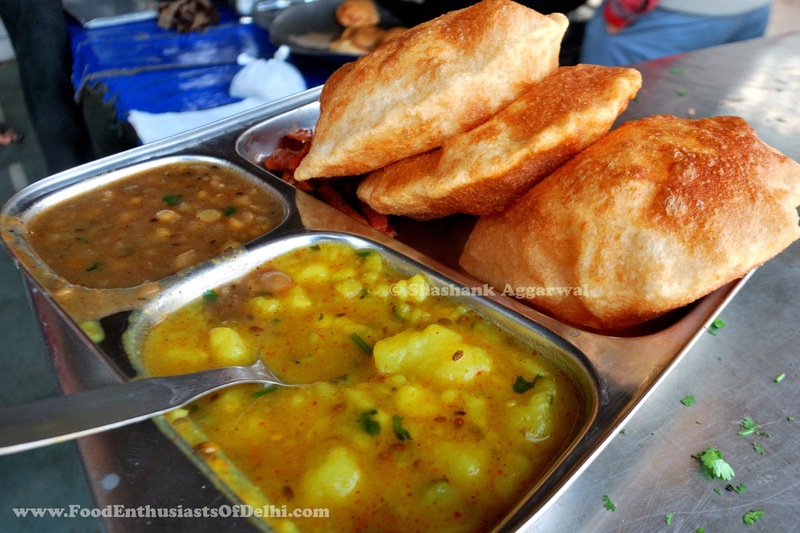 We were attended to and served very quickly; the HOT pooris were served with choley and aloo sabzi, a rare combination in Delhi and Yes Welcome to Punjab. This is how they roll errr… serve. The pooris were crisp and soft with little masala in them, they were made of 70% Wheat and 30% White Flour. 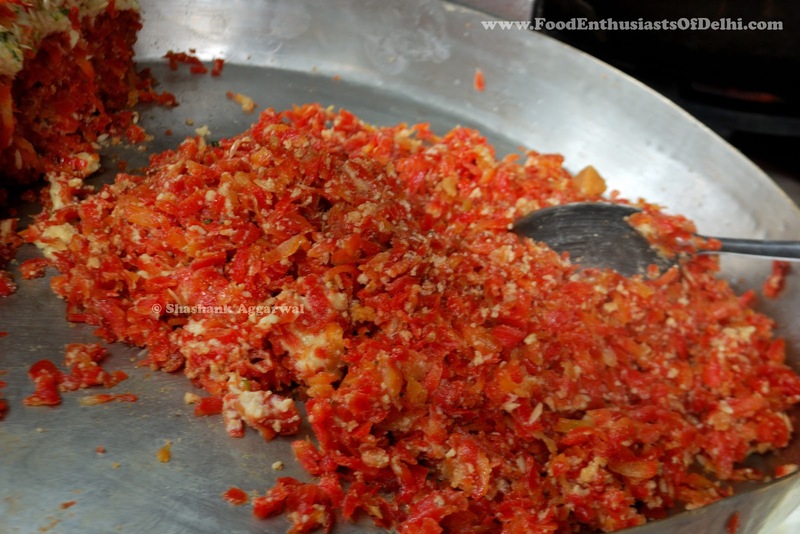 They went best with the choley sabzi as I found the aloo sabzi to be a little bland. 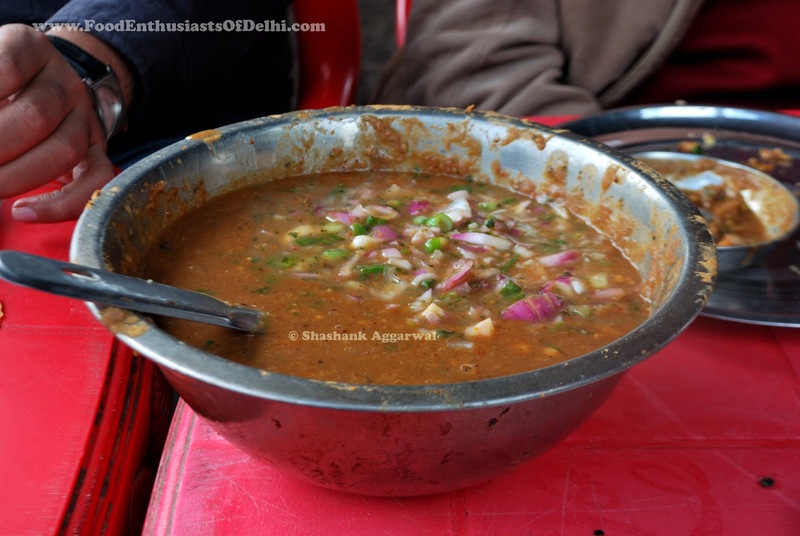 The gaajar ka achaar (carrot pickle) was a great condiment for every bite we had. 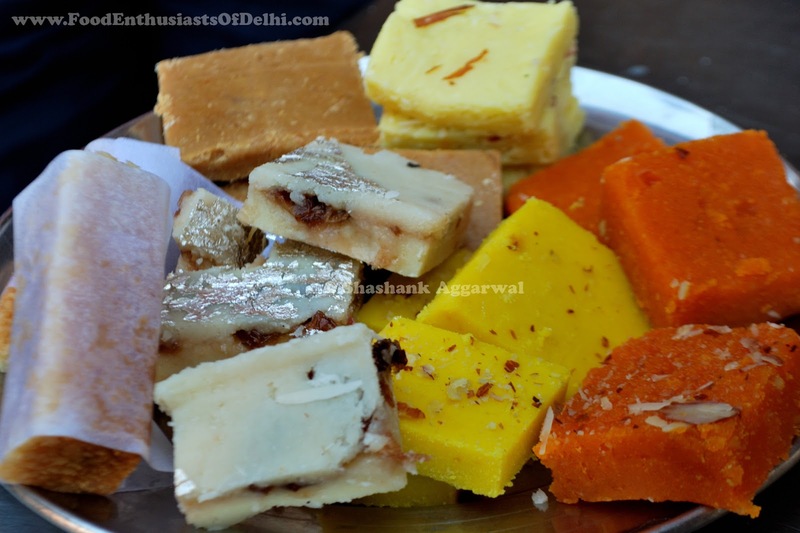 After the main course, it was time to taste the sweets, we settled for milk cake, cream burfi, brown burfi (made of roasted brown khoya and milk), moong dal burfi, stuffed burfi (had gulkand and petha stuffing layer in between) and mooti-choor burfi. All the sweets were just rightly sweetened and gave us a balanced taste. It was the stuffed burfi, cream burfi, brown burfi which took the accolades away and deserve a special mention. A few clicks and a small chat with the owner, the food brigade headed towards Amritsar, 3 hours later we finally reached Amritsar. 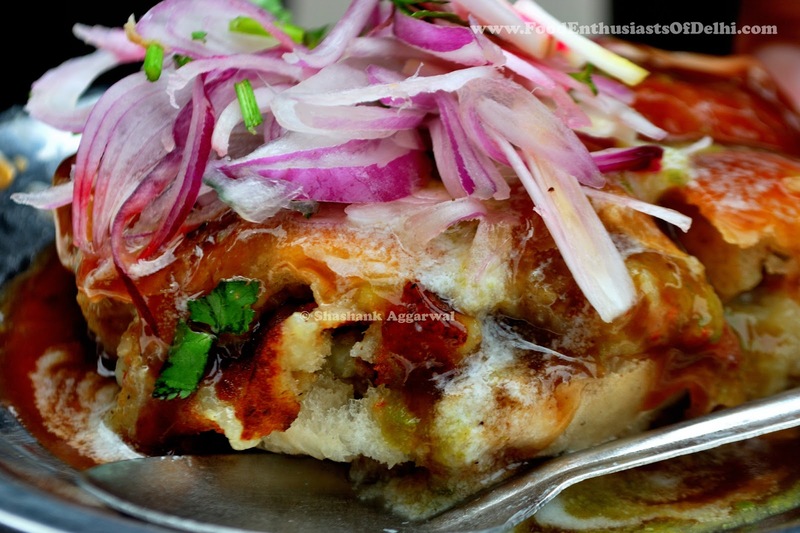 The food brigade decided to head straight to the most talked about Amritsar kulcha waala amongst the foodies. 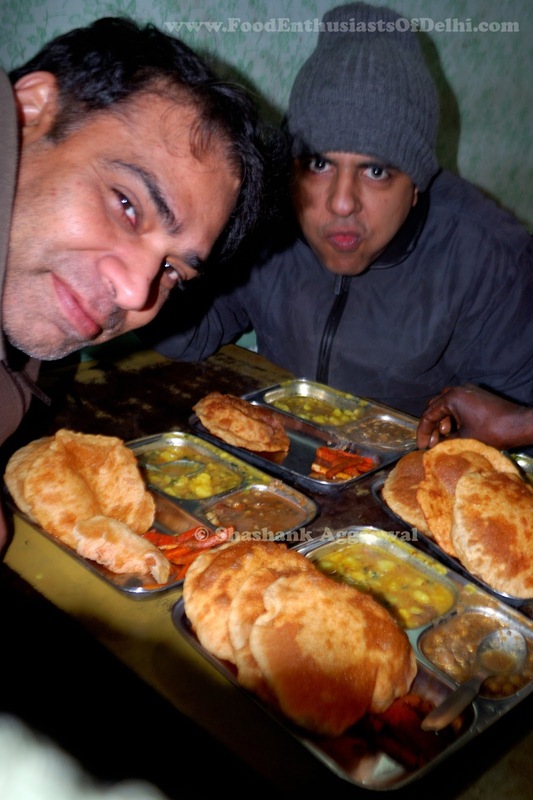 We navigated the Udan khatola directly to All India Fame Amritsar Kulcha waala at Maqbool road. While we waited for the tables to empty out, the boys got down to some serious business capturing great moments in their cameras, a treat it was to see the work in progress. There is no menu here and they only serve a seven layered Kulcha stuffed with Alloo, Gobhi and Paneer mixture accompanied by choley and onions with green chilies in tamarind water. This is one of those places where people from all walks of life converge to taste the greatness it serves to the mortal population. You can see people walking down, in Rickshaws, and the luxury cars there to indulge. As the food brigade went into attack mode, there was a curfew imposed by the click boys of the team to get going. With the curfew lifted, we emptied out the plate of paranthas in seconds. The server was a great observer because he served exactly seven kulchas so that no one is left out and placed a huge bowl of choley to help ourselves for future fillings of choley. 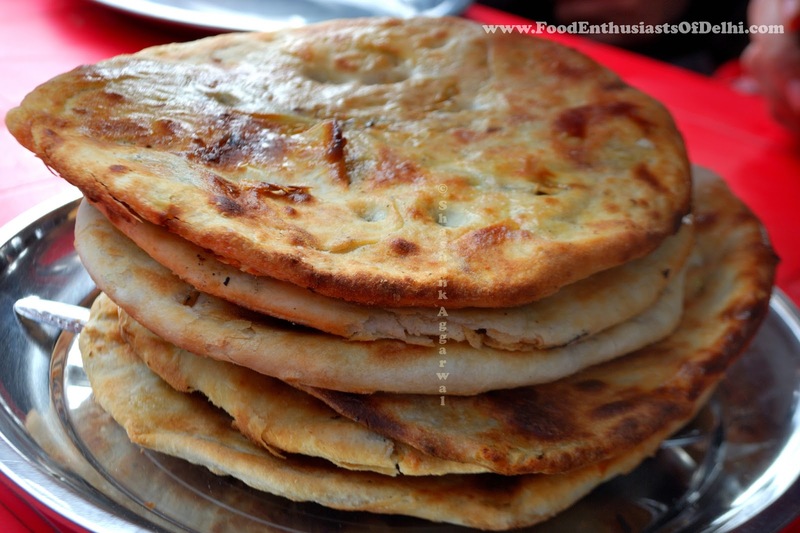 The tandoori kulchas have seven layers and then the stuffing, so as you eat them, you come across layers of crispy wheat chipping off, the only words to describe the great crispy yet soft All India Fame Amritsari Kulchas are to GO TRY THEM… J. They are topped with yellow butter and you can ask for more if not satisfied with what you get. After exchanging burpy pleasantries (ahem), it was time to go hotel hunting and we went straight to Old Amritsar which lies between Gandhi Gate and Golden Temple. The bargain chips were in play and a suite was secured for the food brigade. As soon as the luggage arrived into the room, the food brigade decided to hit the streets of Amritsar. 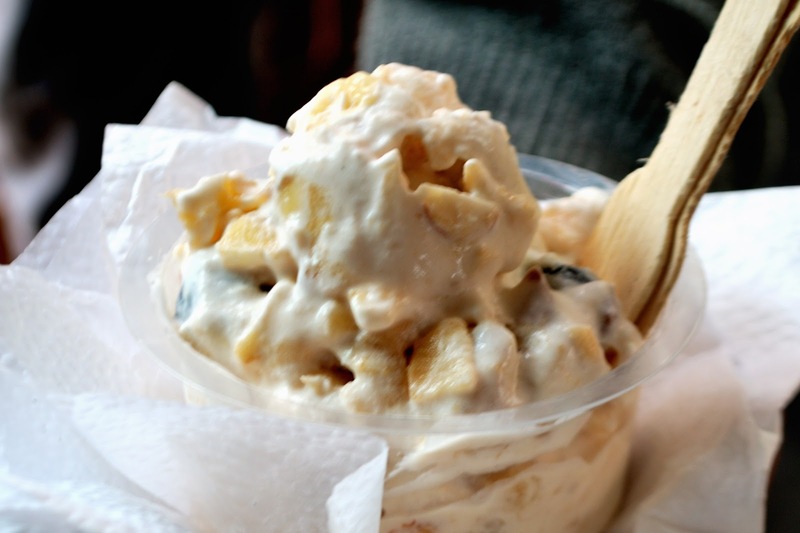 As our perky eyes scanned the surrounding areas of the hotel, we saw a khomchewala ‘ni’ shop named Sharma Ice-cream; we decided to taste the fruit cream on offer which was kind of frozen with lots of fruits n nuts in it. It tasted good and worth a try. Next, was the Badam Milk which can be ignored point blank; Now, we decided to move towards Regent Cinema. As we approached regent cinema we came across a Prem Nath Kulfay waala with Phirni’s on display at the counter. The shop is located on the left hand just before the regent cinema chowk aka lassi chowk aka chowk regent. The surprise package was the Phirni at the bottom, Kulfi added to it and topped with Faluda and Rabri. 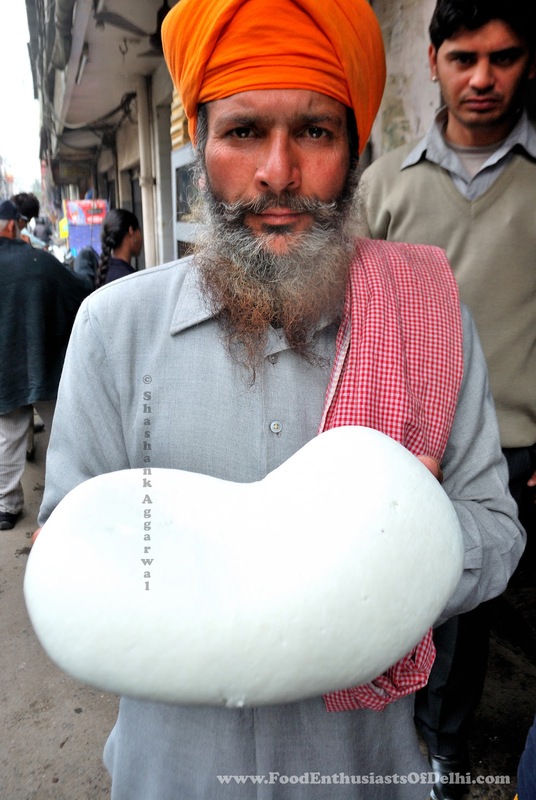 It is a unique delicacy combining some of the most potent Punjabi sweets, no wonder it is called Kulfa and not Kulfi. A few steps forward and we landed on Punjabi Lassi and Milk Bhandar, at Chowk Regent Cinema; you can find the proprietor S. Surjan Singh marching the troops efficiently. This shop is famous for its Pedewaali lassi (unfortunately we did not get to try it) and the regular Punjabi lassi. 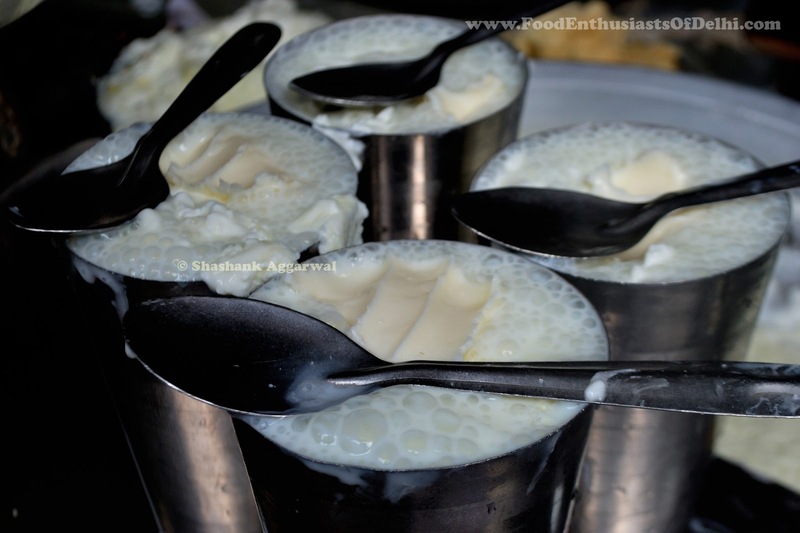 We ordered the lassi’s and there they came, the lassi served here is a fine and frothy blend of curd, and sugar with a lump of white butter with a malai layer on top. 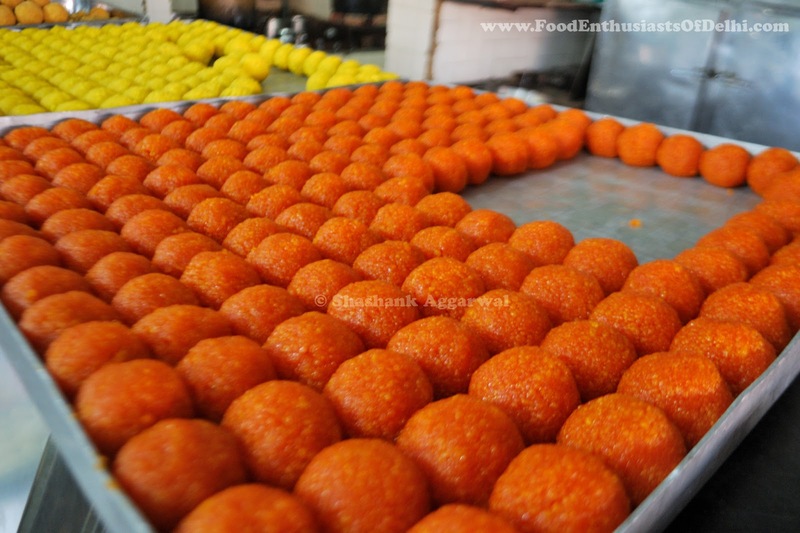 The milk bhandar also serves Gajar ka Halwa and Milk cake. We had a split verdict for both of them, while Shashank appreciated the taste of Gajar ka Halwa for me the Milk Cake was a better deal. Nevertheless, you should taste both of them. If not for the other delicacies, we would have definitely had more than one lassi here, it is a must GO place for anyone visiting Amritsar. 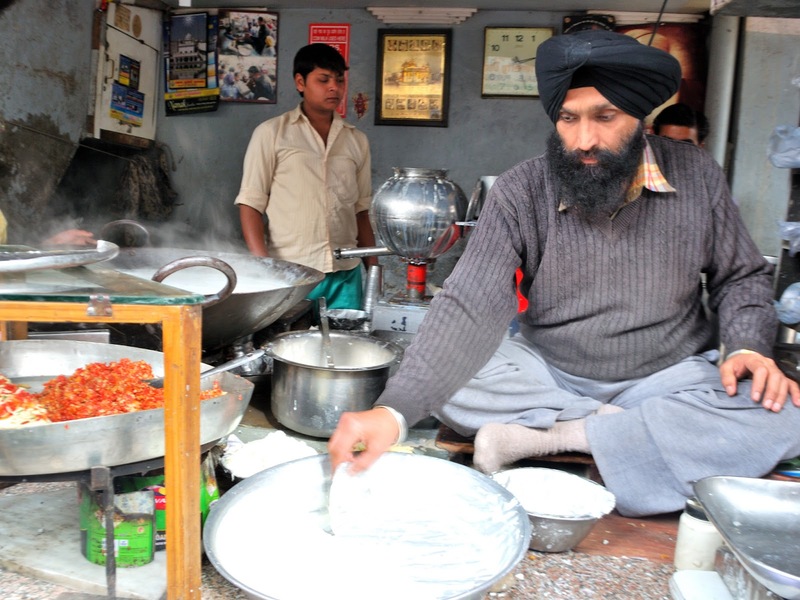 There is another shop adjacent to Surjan Singh’s shop known as Giani lassi. 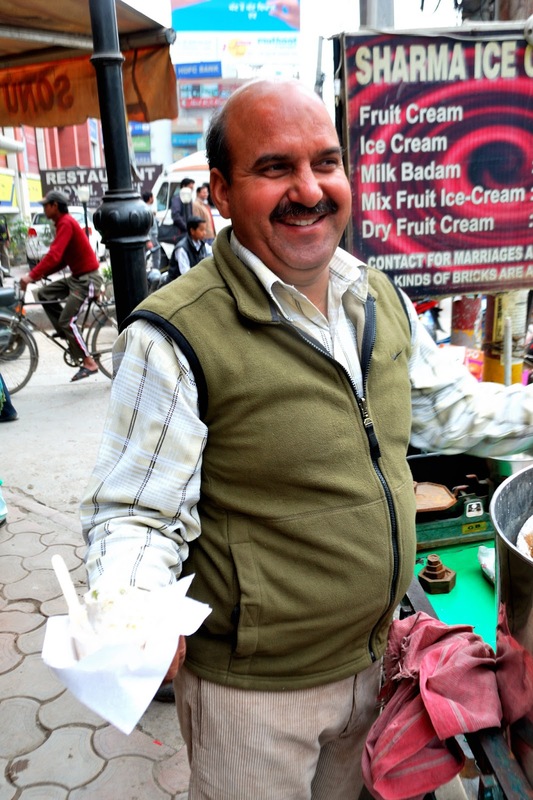 We tried the lassi over there but it was not as good as what we had at Surjan Singh’s shop. 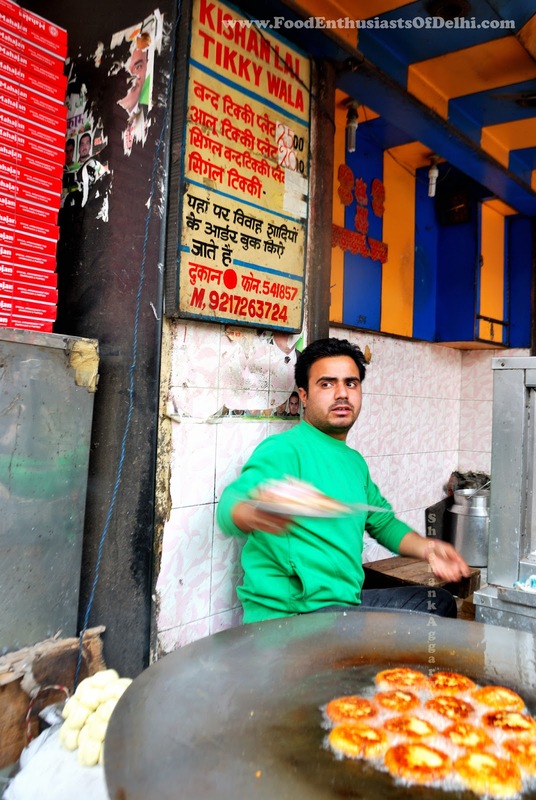 It is primarily a curd and milk shop which serves Lassi. 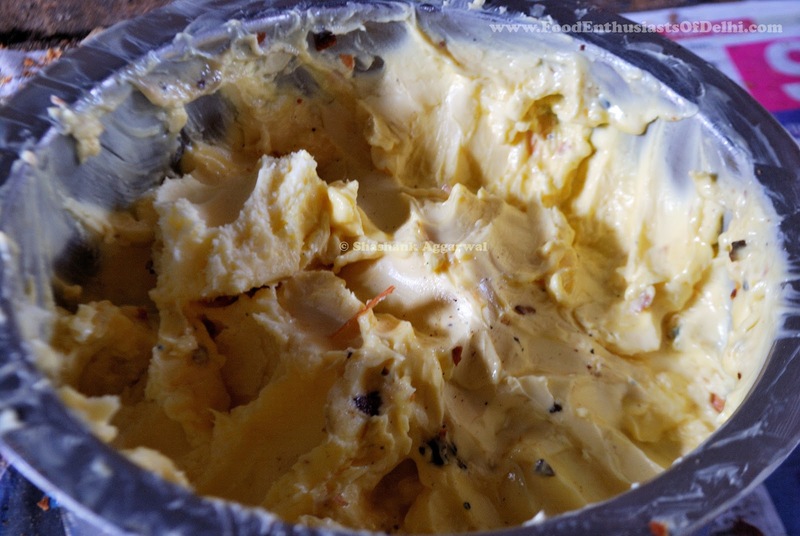 However, Giani lassi also serves Rabri and it was very very creamy and tasty, another hidden gem we stumbled on. 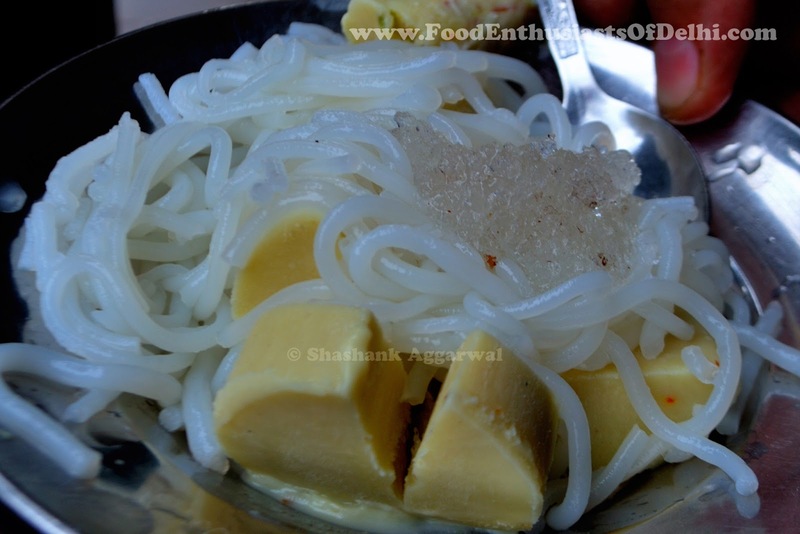 The next point of interest was Mahajan Kulfi near Gandhi Gate. 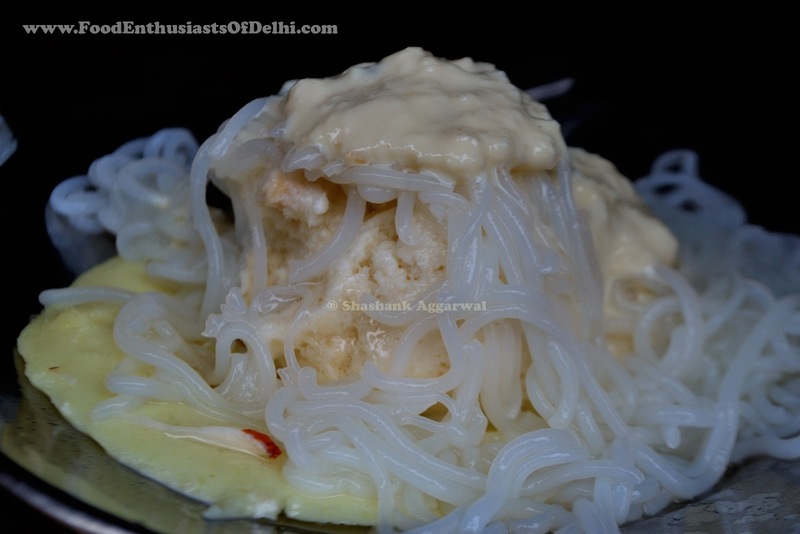 As we approached Mahajan Kulfi, we came across a Tikki stall at the corner of Mahajan kulfi. 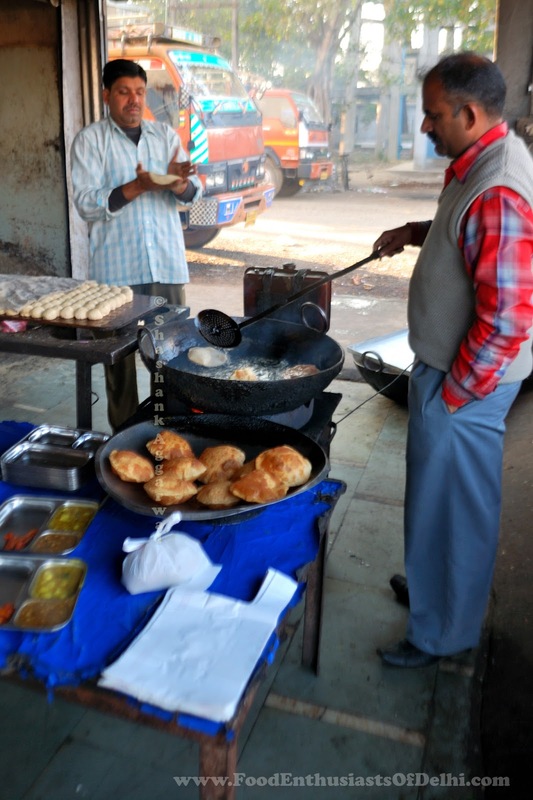 He was serving Bun Tikki with the usual condiments. We ordered for a plate of Bun Tikki and a plate of just Tikki. 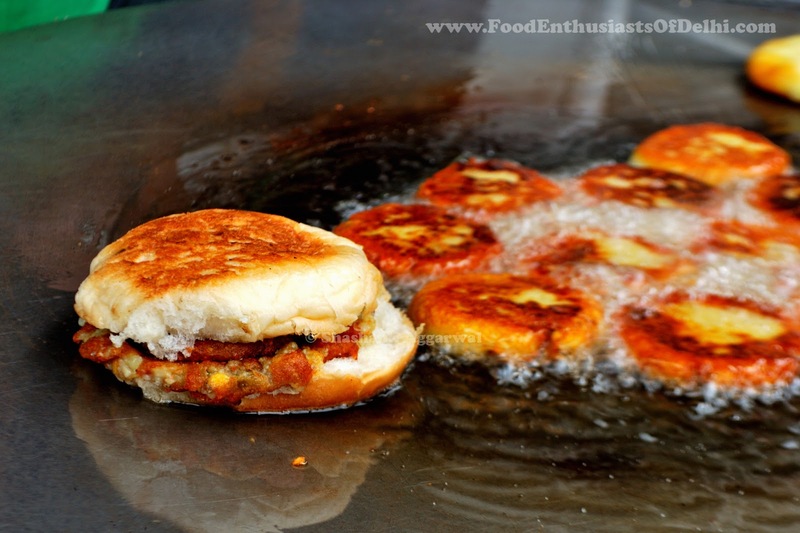 The Bun’s were soft and fresh while the tikki’s were crunchy and soft. They came with the usual suspects in Saunth (sweet) and Pundina (Mint) chutney. 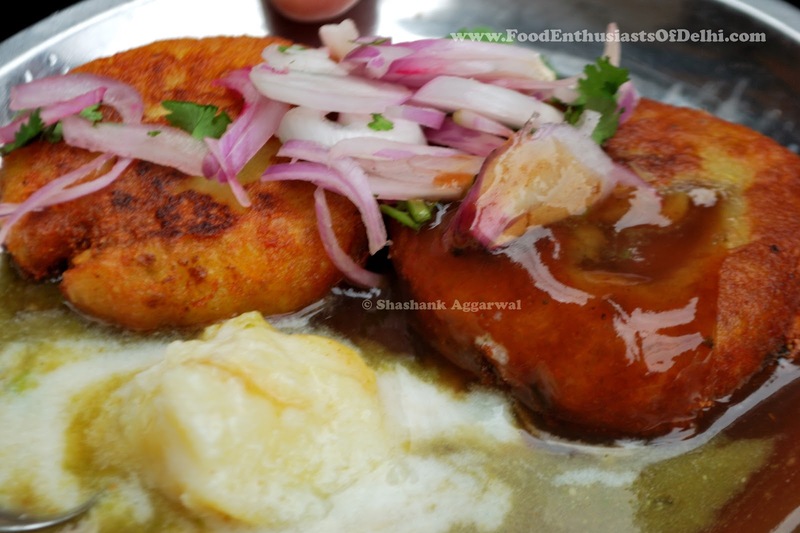 A small piece of boiled potato with curd was placed on the side giving it a papri chaat kind of experience. 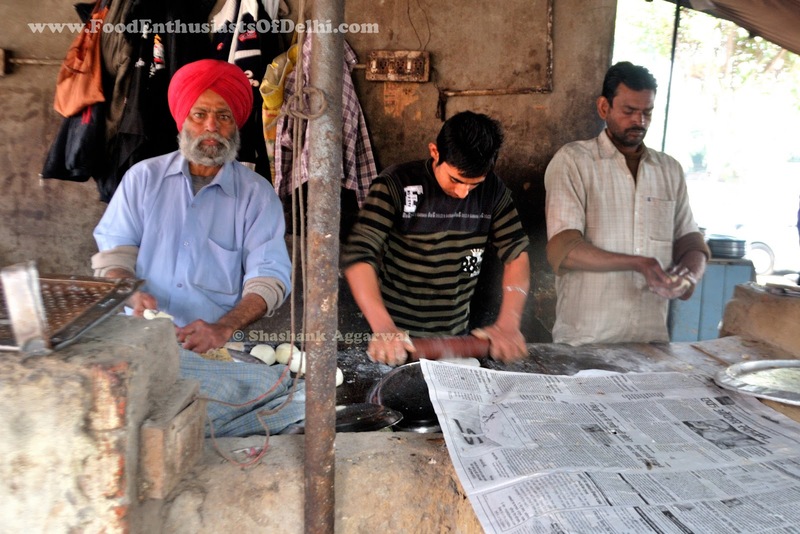 This is another reason why they call Amritsar a food paradise, a place where the best food is cooked on its street from the heart. 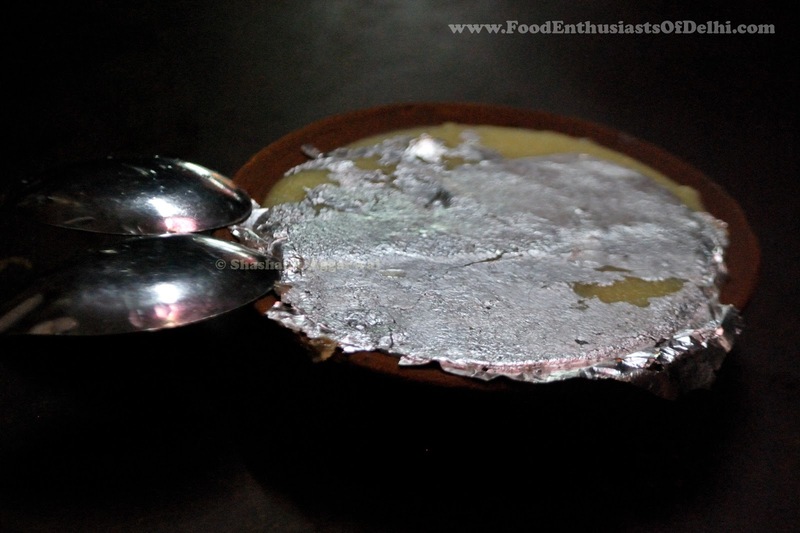 It was time to check out what Mahajan Kulfi is all about, we ordered couple of plates. 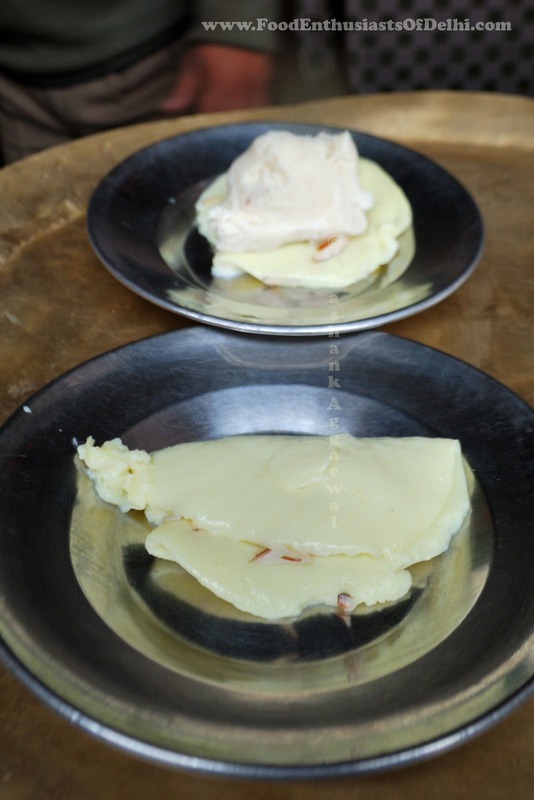 The kulfi’s were kind of stuffed with dry-fruits but lacked in taste, the rich creamy texture that was expected was missing for sure and time for a few clicks and then pack-up from here was agreed upon. The food brigade decided to take some rest and visit Harminder Sahib in the evening. It was great pleasures to have Sidharth Chatrath join the food brigade for the evening. After exchanging pleasantries we decided to head out towards the Harminder Sahib aka Golden Temple. 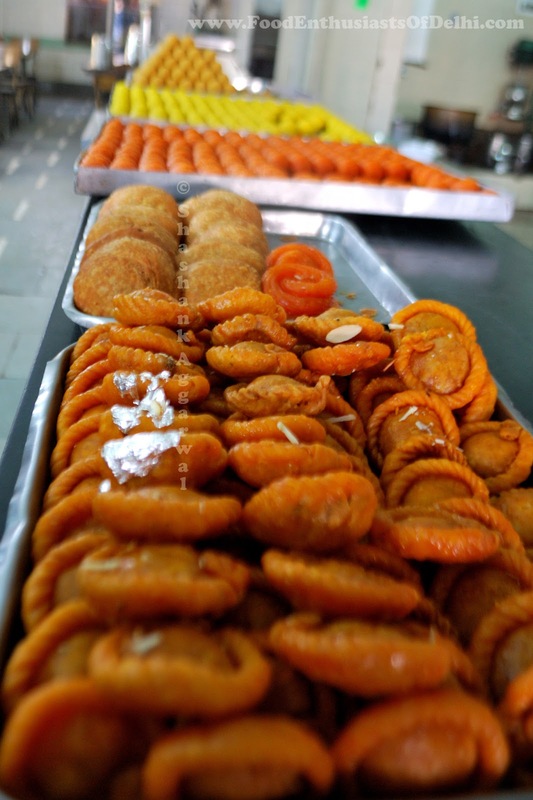 On our way to the Golden Temple I wanted the brigade to sample some snacks at a personal favorite place of mine. 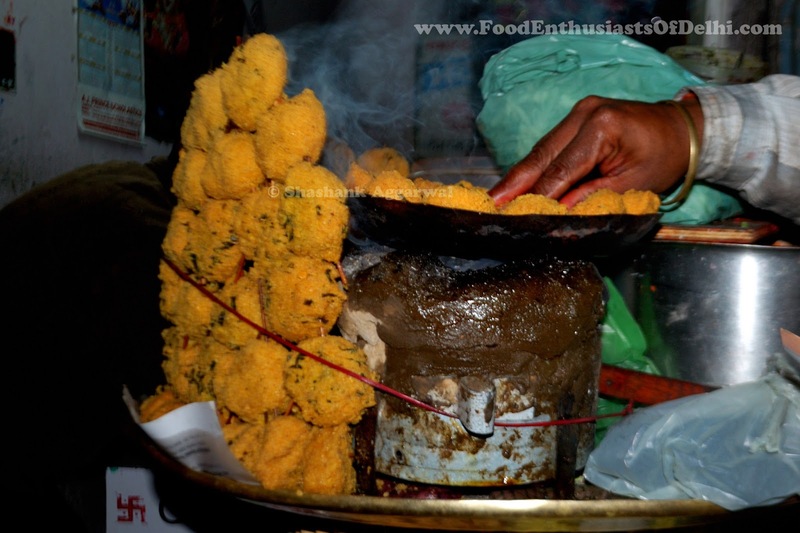 So, the next stop for the food brigade was Shri Krishna Mishtaan Bhandaar located outside the Shri Krishna temple near the golden temple multi-storey parking or opposite municipal corporation office. I am a personal fan of this place for their Phirni’s, Paneer pakodas and the sweets; it’s a great snacking place. We ordered couple of Phirni’s and a plate of Paneer pakodas. The phirni’s are done the right way and not too sweet which makes you ask for a second helping. 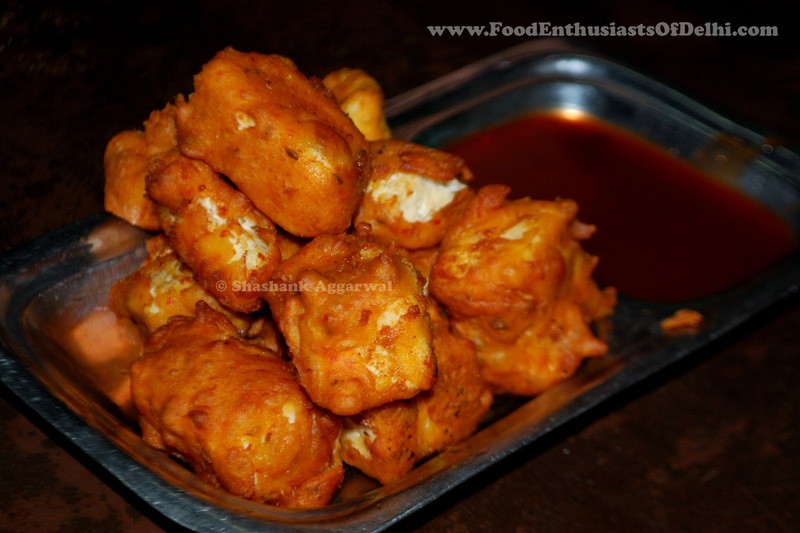 The paneer pakodas have been the way they are today, very soft, succulent, and mildly flavored, they are served with sweet and tangy chutney which is like cherry on the cake. Another interesting and very different product we had here was the Rasbari, it had two small rasgullas in a rabri, it was very different from the kesar milk immersed rasgulla’s we get in Delhi. Another hidden gem we stumbled upon. 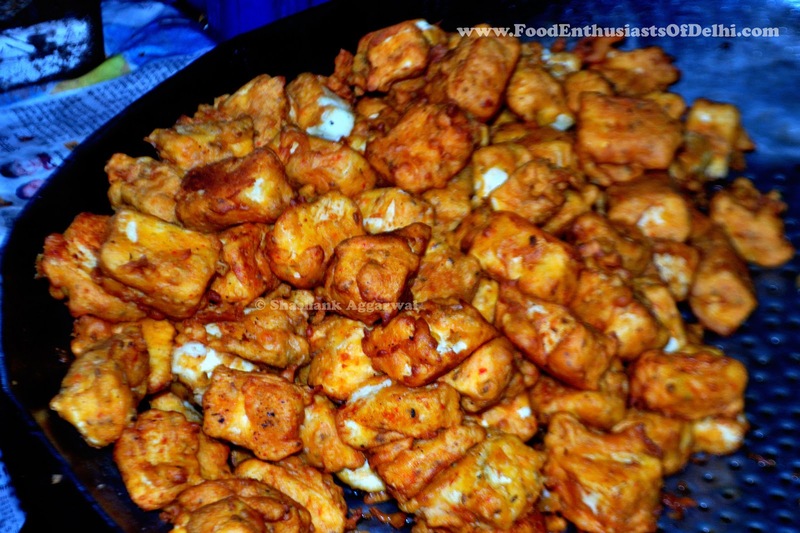 Everyone unanimously agreed that these are the BEST paneer pakodas they have had ever. It was time for round two, 3 more phirni’s and 2 more plates of paneer pakoda later we realized it was time to save some valuable tummy space for dinner. It was time to visit the Golden Temple, after paying our respect we headed towards the open kitchen aka Langar area. 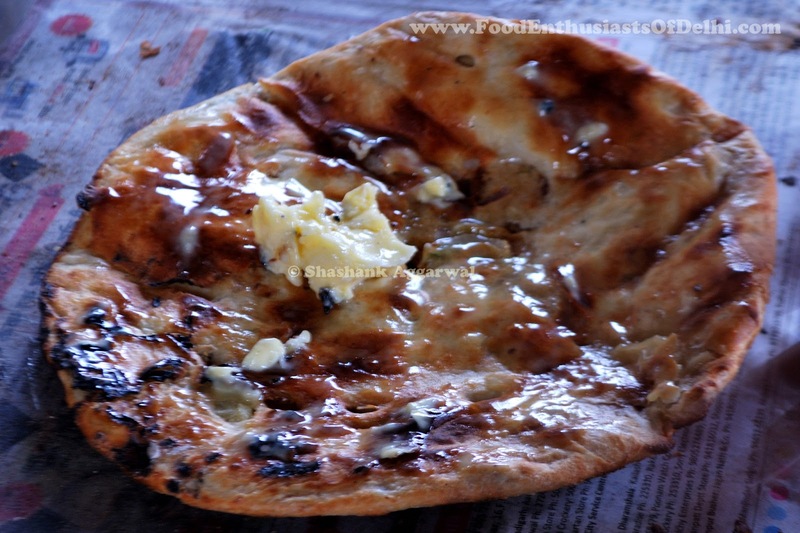 The langar prasad consisted of Maa Ki Kali Daal, Kheer and Chapati’s. Really there are no words to describe the simple yet delicious the prasad is at each and every Gurudwara, divine experience it was. Siddharth left for the evening and we were back to the original formation of food brigade. 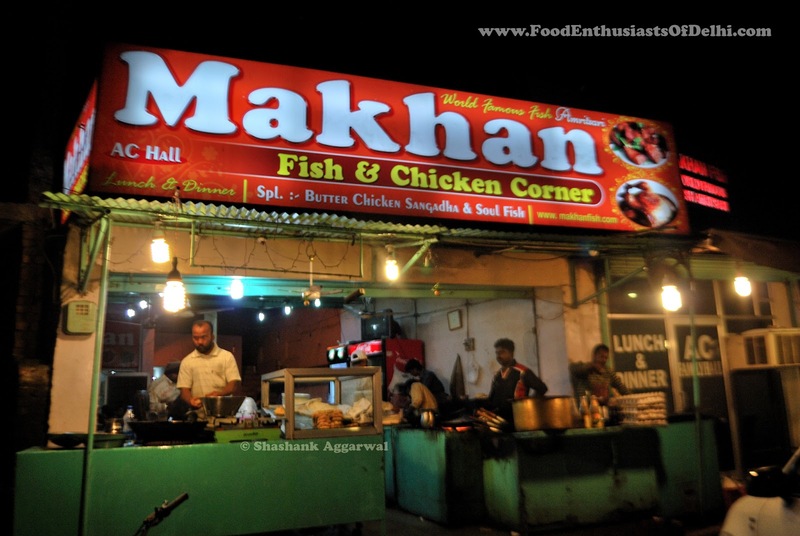 We decided to visit Makhan Fish at Majitha Road (I believe the one at Lawrence Road has now shifted here), we ordered Amrtisari Fish Fry aka Makhan Fish, Paneer Tikka and Paneer Pakoda. 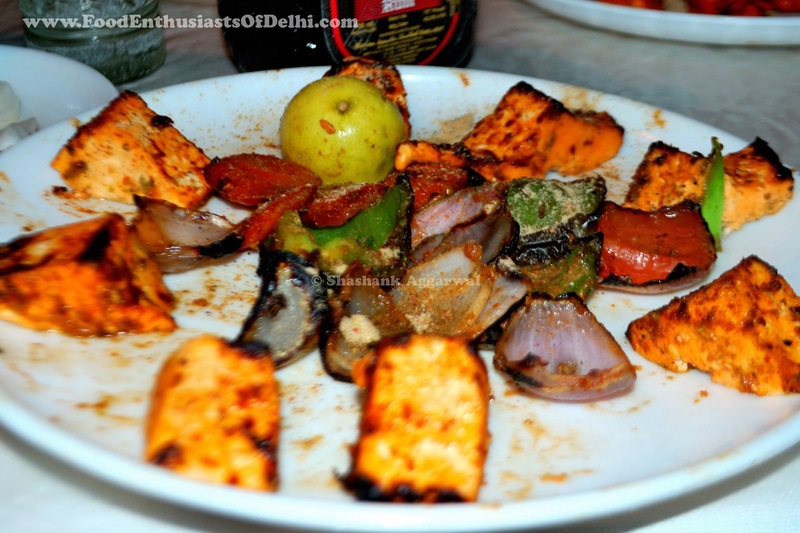 The Paneer was hard and the taste bland, both the dishes can be ignored. The biggest disappointment of the night was the Makhan Fish; it was a total disaster, classic case of Naam Badey Darshan Chhotey. The taste was bland, the marinating inadequate, looked like a classic case of someone in a hurry to get the job done (sic). It was time to retire for the day, and we all headed back to the hotel with our heads down in disappointment but hey, the night was still young…..
As it is rightly said that the way to a man’s heart goes through his stomach, it was during a discussion at the park plaza dinner that Shashank offered to convert an upcoming FED friends event to a Non-Vegetarian FED Raid in case I was open to lead and I must THANK Park Plaza for the good food we ate there. 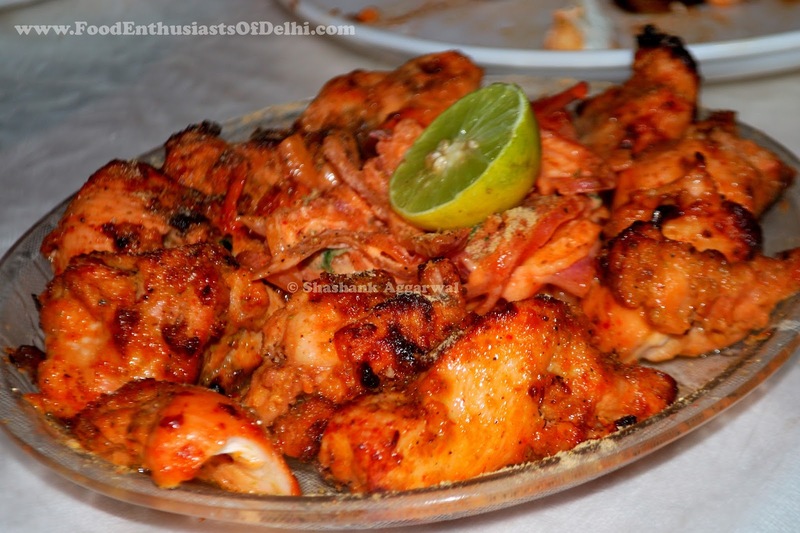 So, that’s when we decided to open the invite to all fellow FED members for a mid-week raid at Ganesh Fish in Karol Bagh. Last Friday some of the fellow FED’s had done an Old Gurgaon Raid to some lip smacking places and we had agreed to visit Ganesh fish this Wednesday. I reached the meeting point by 7:10 PM and was pleasantly surprised to see 12 fellow FED members there. After the exchange of pleasantries we started walking towards Ganesh Fish at 7:30 PM and were out there by 7:45 PM. Since the seating area inside is small, we had to wait for 15 mins so that the large crowd of 12 hungry FED’s could be accommodated. As we squeezed ourselves in the tiny back alley of Ganesh’s inner seating place (once a backbencher always a backbencher), we ordered Egg Pakora, Tandoori Fish, Fish Fry with bone, Boneless Fish Fry, Mutton Seekh Kebab, Tandoori Chicken, Chicken Pakora, Mutton Korma and Chapati’s. The Egg Pakora was the first thing to come, it was fresh, the batter soft but overall a bland taste, he sprinkled some Chaat Masala over them but that did not help. The Mutton Seekh Kebabs, looked fresh, and well done. They were soft, chewy and tasteful. The Tandoori Chicken was the next item to arrive; mildly flavored it was and can be ignored. Probably, the local colony dhaba in your area serves better. We waited for the star item (Fish) to arrive with bated breadth and the first to arrive was Tandoori Fish and a full fried medium sized fish. 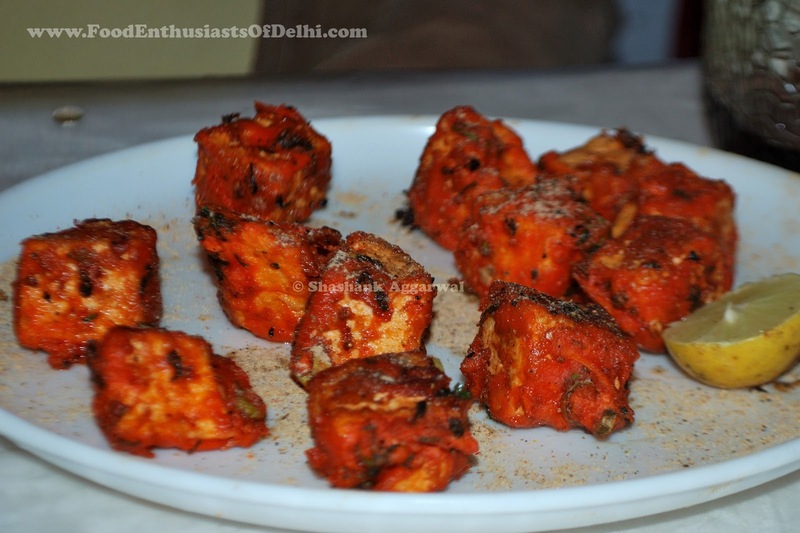 The pieces in the Tandoori Fish were large and had a tangy flavor to it. FED members who have tried Paramjeet at Moti Nagar agreed that Paramjeet is way ahead of Ganesh. I agreed to their point of view, even my local (now closed) Dhaba served better Tandoori Fish. It was time to taste the next product, the Fried Fish. 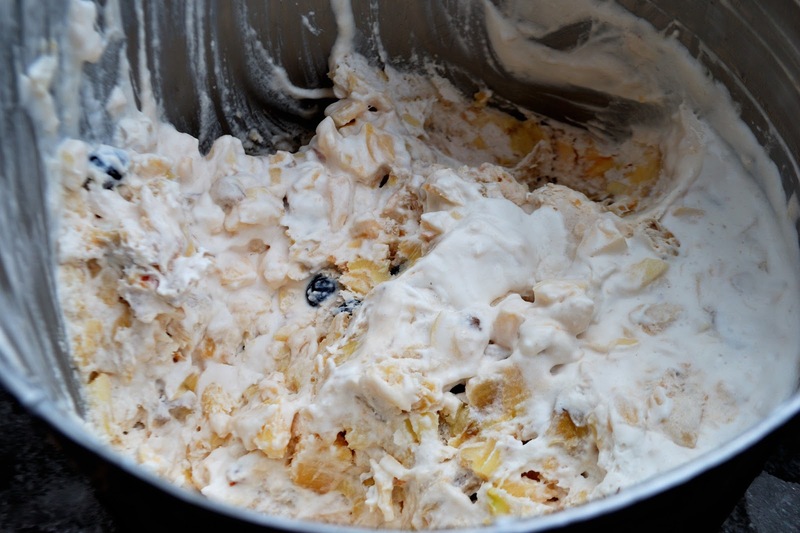 Again, the batter had no taste and texture. The batter coating was uneven with uneven frying, looked like a case of trying to fry too much in too little space. We had Hemant, Shashank, and Inder joining us to check on how the evening was proceeding and after a little chat with them we decided to order boneless Fish Fry and Chicken Pakora with mutton korma and chapatis since we had couple of FED members joining us (took the tally to 14). 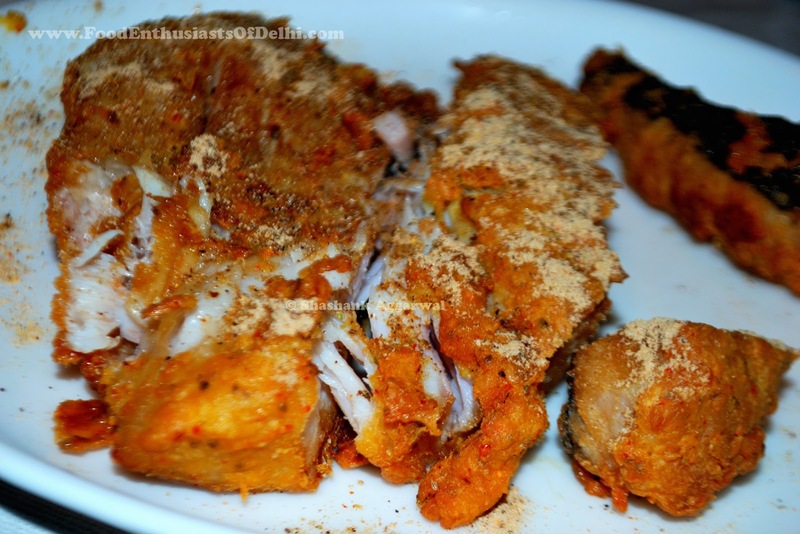 The boneless Fish Fry was better since it was fried in small pieces and had better flavor to it. 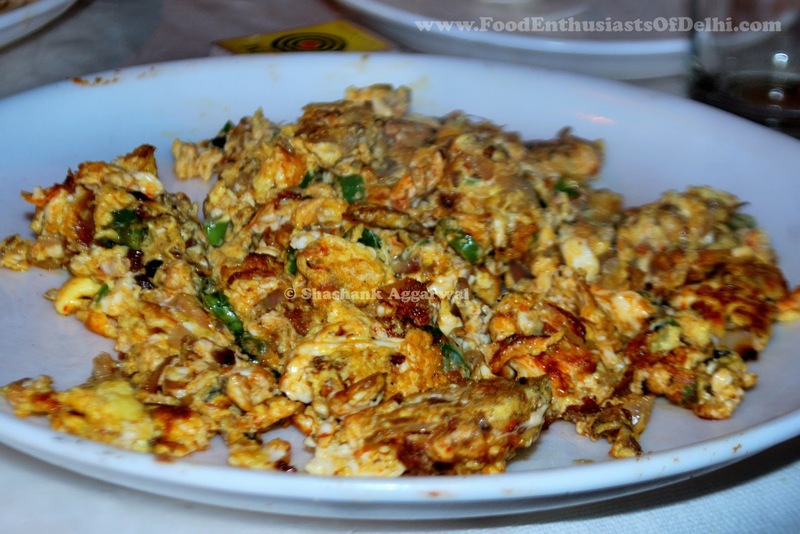 The Chicken Pakora is a better bet than Tandoori Chicken in terms of flavor and taste. The Mutton Korma was bland; it tasted like a Vegetable Curry which had no spices in it. The mutton was rubbery and not at all good. All in all the fish at Ganesh is fresh to say the least but order if you must, our bet is on Chicken Pakora, Mutton Seekh Kebab and Boneless Fish Fry. While all of us were mumbling and grumbling regarding the experience at Ganesh there was a Gola urge that hit us from Ajit’s end, he wanted to have a Kaala Khatta Gola….huh…??? After a cheeky commitment to him, and couple of quick SOS calls to fellow FED members we decided to have light dinner at next door Sandoz. At Sandoz we ordered Dal Makhni, Butter Chicken, Chicken Biryani, and Malai Chicken Tikka. 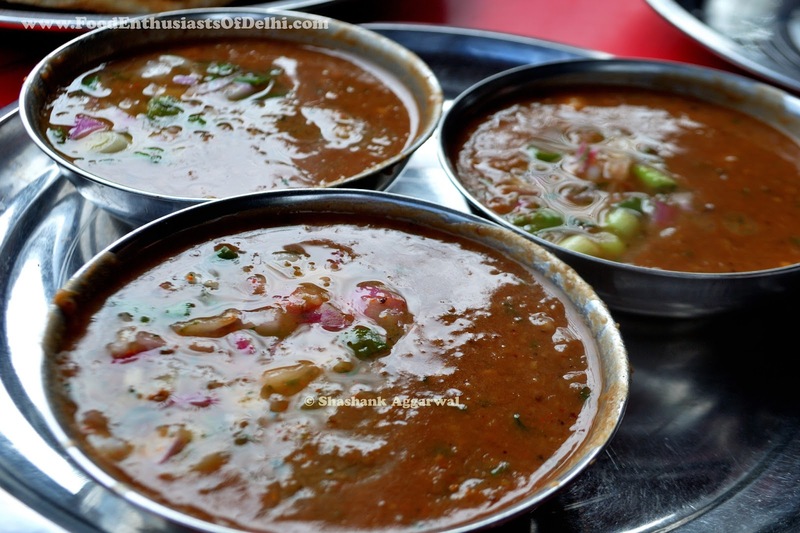 The Dal Makhani was overtly creamed which made it bland and was ignored by all. The boneless Butter Chicken has soft and crunchy pieces with a please to all gravy which was not overtly creamed or buttered bringing in nice decent texture to it. The Malai Chicken was soft and tender with a sour flavor to it indicating use of cream and curd combination, finally something with taste. The highlight was the Chicken Biryani and the curry served with it. The biryani was cooked to perfection probably a good dum, with an aromatic flavor to it and blended very well with the curry. The quality of rice and chicken used were appreciated by all. After having much better food at Sandoz, Ajit’s Gola was back to haunt us and there started the quest to search for a Kaala Khatta Gola at 10 in the night. After a short walk we realized that Gola is a mistimed adventure we decided to settle for the famous Stick Kulfi which was the standard fair at 10:20 pm in night.